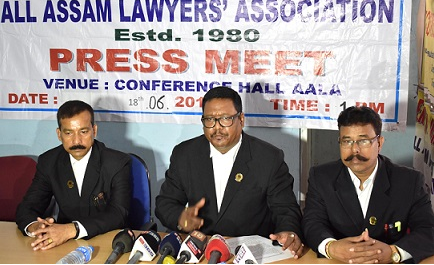 The All Assam Lawyers’ Association (AALA) on Monday alleged that a section of people have been trying to politicize the mob lynching incident at Panjuri Kachari Gaon under Dokmoka Police Station in Karbi Anglong district. The AALA leader, while appealing to all for maintaining peace and harmony, also made an appeal to name the waterfall at Kangthilangso near the incident of lynching after the victims – Nilotpal Das and Abhijeet Nath. It may be mentioned that the two artistes from Guwahati were lynched at Panjuri Kachari Gaon on their return after visiting the waterfall at Kangthilangso. The AALA also demanded that scientific method be applied in the probe into the incident. He urged the State Government to appoint a public prosecutor in this regard. Demanding exemplary punishment to the accused in the mob lynching incident, the AALA also threatened to move the Supreme Court if the Government does not fast track the probe. Regarding the update process of the National Register of Citizens (NRC), final draft of which would be published by June 30, 2018, Das said, “Due to negligence or for not providing proper documents, names of some people may not come in the in the final draft NRC.” He urged the Government to make arrangements for tight security in the sensitive areas of the State so that untoward incidents cannot take place after the final draft publication. Das announced that they would provide free legal help to the people who miss their names in the final draft NRC. The press conference was also attended by AALA joint secretary Benudhr Nath and AALA, Guwahati, general secretary Amal Ch Baishya. “We would like to warn those political parties and organisations who have been striving to protect Bangladeshis. Immigrants must be deported at any cost,” said Das. He also said, “We condemn the Centre’s move to implement the Citizenship (Amendment) Bill, 2016.